Field Properties (Chart Report) - Reporting4Act! 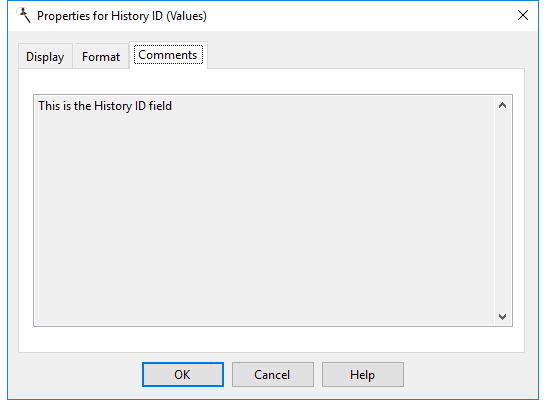 The Properties dialog allows you to specify how the field appears in the report. You can display this dialog for the highlighted field by clicking the Properties button in Step 3 of the Chart Wizard, double-clicking the field, or selecting the field and pressing Enter. Total type: this option, which is only available for values fields, allows you to specify whether a total ("sum"), average, highest, lowest, count, or count distinct value appears for this field. Only Count and Count Distinct are available for non-numeric fields. The difference between Count and Count Distinct is that Count counts the number of records while Count Distinct counts the number of records having unique values on this field. For example, if there are 100 order records but all orders were placed this week, using Count on the Order Date field would display 100 but Count Distinct would display 7 (assuming at least one order was placed every day this week). Sorting: this option, which is only available for values fields and only if there's just one values field and no series fields, allows you to specify whether the chart is sorted by the category (the Not Sorted setting, which is the default) or in ascending or descending order by value. Axis for scale: this option, which is only available for values fields, specifies whether the left or right axis is used for the scale for this field. This is normally set to Left but if you use more than one values field, you may want to set one of them to Right, especially if the range of values is significantly different between the fields. Display date as: this option, which is only available for date fields used as categories or series, allows you to specify whether the actual date is displayed ("Date") or whether the results are summarized by hour, day, week, month, month and year, quarter, year, or fiscal year. Choose the desired function from the drop-down list. If you choose "Week," the Week starts on setting in the Options dialog determines which day a week starts on. If you choose "Quarter" or "Fiscal Year," the Year starts in setting determines which quarter number or year a date falls in. Sort: click the Ascending button to sort this field from lowest to highest, or the Descending button to sort from highest to lowest. This option is only available for category and series fields. Use default format: if this option is turned on, which it is by default, Reporting4Act! uses the defined format for the field. If the format for the field changes in the future, the report uses the new format automatically. If you wish to change any of the formatting options, turn this setting off. Show 1000s separator: if this option is turned on, the values in the field are formatted with the thousands separator defined in the Regional Settings applet of the Windows Control Panel. Display $ (the appropriate currency symbol for your system is displayed in place of "$"): turning this option on displays the currency symbol defined in the Regional Settings applet of the Windows Control Panel in front of the field's value. Decimal places: the number of decimals to display. The Link page, which only appears for category fields and only if the chart isn't included in a quick or cross-tab report, allows you to link a category (for example, a bar in a column chart or a slice in a pie chart) to another report, commonly known as a "drilldown." When you move the mouse pointer over a linked category in the Preview window, it appears as a hand so you can tell that clicking it causes the linked report to run. The options on this page are disabled unless you set Link Type to Report. Link Type: choose Report to link to another report. Report to run: this option specifies which report to run when you click the category in the Preview window. Click the down arrow and select the report from the list; you have to expand the folder the desired report is in to select the report. When you've found the desired report, double-click it or select it and click the down arrow to close the report selector. 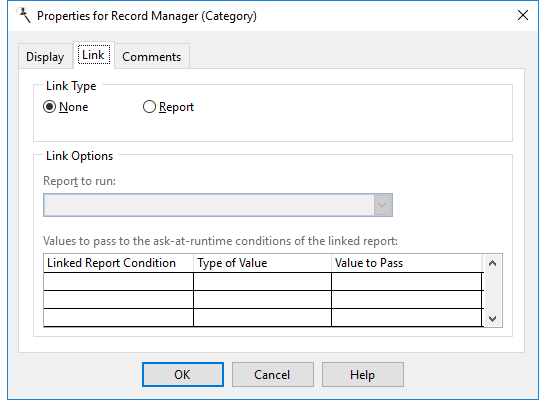 Values to pass: this option allows you to pass values to the ask-at-runtime filter conditions of the linked report. Without this option, when you click a category linked to another report, that report prompts you for any of its ask-at-runtime filter conditions, which may not make sense. For example, suppose you have a chart showing sales by country and you've linked the country field to a report showing sales for that specific country. The linked report has an ask-at-runtime filter condition on the country name, so when you click a country in the chart, the linked report runs and asks you for the country name. That seems odd, because you just clicked a particular country and now it wants you to specify which country. To make this more seamless, you want to tell the linked report which country you just clicked. You do that by specifying what value to pass to the ask-at-runtime filter condition of the linked report. In this case, you'd specify that the country should be passed to the linked report. Since that value is passed, the report doesn't need to ask you for the country name, and simply displays the sales for the country you clicked. None, which means a value won't be passed to this condition, so you'll still be prompted for its value. Filter Condition, which means this report contains the same ask-at-runtime filter condition as the linked report, and you want the value you specify when you run this report passed to the linked report. For example, if both reports have an ask-at-runtime filter condition on the order date, you'd want to use the same order date range you specify when you run this report used for the linked report. So, choose Filter Condition and select the field used for the condition in the Value to Pass column. Field, which means you want to pass the value of the field specified in the Value to Pass column for the current record. For example, when you click the company name, you want to pass the customer number to the ask-at-runtime filter condition on customer number to the linked report, so choose Field and select the Customer Number field in the Value to Pass column. Ignore this condition, which means you want to ignore this condition (that is, act like you clicked the Ignore this condition option in the filter value dialog) and not display the dialog asking you for the value for this condition. Note that only fields selected for the report appear in the list of fields in the Value to Pass column, so be sure to include the desired field in the report. If that field is in the Available fields list, it won't actually appear in the report but will be retrieved from the database. The Comments page shows any comments about the field, which is often used to provide a description of the field's contents.